For a long time, perhaps too long, the HR and training functions have dictated learning for employees. But workers have started taking things into their own hands as they realize their competitive advantage, and their employability, is tied directly to their skill set. This shift from relying on L&D to self-directed has left many organizations wondering what their next move should be. The best place to start is putting yourself in the learner’s’ shoes and examine the human behaviors around growth and development. 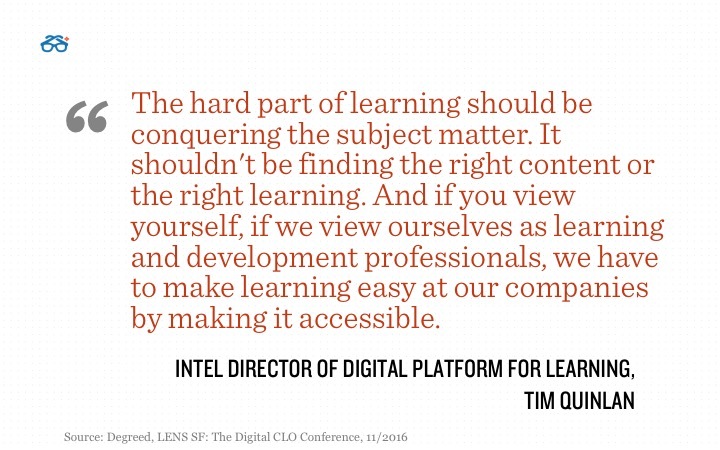 At Degreed LENS, Tim Quinlan of Intel shared the value of approaching your workforce, the learners, as consumers or customers. Degreed research compliments Tim’s story. Almost 85% of survey respondents said they learn things for work by searching online at least once a week, nearly 70% learn by reading articles and blogs every week, and 53% learn from videos in any given week. HR, training and L&D provide the mostly high-value learning experiences people need sometimes, whereas Google or asking a peer or boss for guidance happens all the time, every day, right at the moment of need and not 3 weeks down the road. Recognizing that learning is happening all the time, not just through L&D offerings, it makes sense that “a new type of employee learning is emerging that is more “consumer- like,” commented Josh Bersin during his presentation at Degreed LENS. The most important tool in your kit for 2017? Your workers. “If you’re not focused on the experience of the employee, and you’re focused on what you want to do and the content you want to build and how great it is, you’re missing the boat,” added Bersin. Want to hear more about how organizations such as Intel and Atlassian are embracing the consumer mindset? Check out the highlight video from Degreed LENS in San Francisco. For more content from the LENS event, visit the Digital CLO content library!